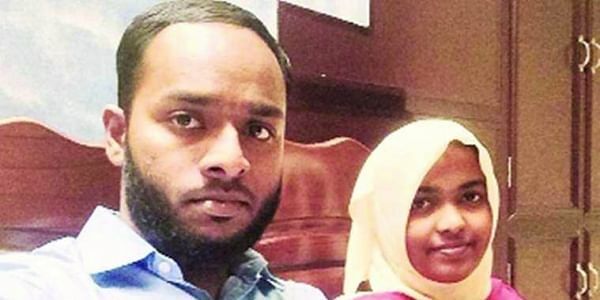 Jahan was questioned a week after the Apex Court gave its nod to carry on investigation into the conversion of Hadiya and her marriage with him. Was Hadiya a stranger’s hostage? KOCHI: The National Investigation Agency today questioned Shafin Jahan, days after the Supreme Court gave its nod to it to continue its probe into his marriage with Hadiya, a Kerala woman at the centre of an alleged love-jihad case. NIA sources said the probe team "re-examined" Jahan today for clarifying certain facts from his earlier statement. They, however, did not elaborate as the matter is sub-judice. The NIA had earlier investigated Jahan and submitted its statement before the Supreme Court. The marriage of the couple was annulled by the Kerala High Court last December after her father alleged that his daughter was being indoctrinated and may be taken ISIS territories in Iraq and Syria by extremist Islamic outfits. "We make it clear that the NIA investigation shall continue in accordance with law," the Supreme Court had said last week while allowing the 24-year-old woman to resume her studies at the homoeopathic college in Tamil Nadu's Salem. She was placed under her parents' custody since her marriage was annulled by the Kerala High Court.